Glice® Synthetic Ice Rink Installation: Snap, Snap – as Easy as That! Have a look at this time lapse video of a Glice® synthetic ice rink installation in Israel to get an idea of the simplicity behind our systems: connected by an innovative tongue and groove mechanism, you just snap the panels together and set up the synthetic ice surface and dasher boards in no time! On top of that tongue and groove allows for more stability and a smoother surface than other systems to guarantee 100 % skating fun! The desert climate of the UAE calls for inventiveness and Dubai has long been the frontrunner for technological future orientation. That’s why an artificial ice rink by Glice® fits in perfectly at Next Generation School, one of Dubai’s most progressive educational institutions. Zero energy, zero water, 100 % fun is now the motto of gym class! For those who still wonder, whether waterless Glice® synthetic ice rinks can compete with the glide effect of conventional ice, check out these stunning French ice skating performances! 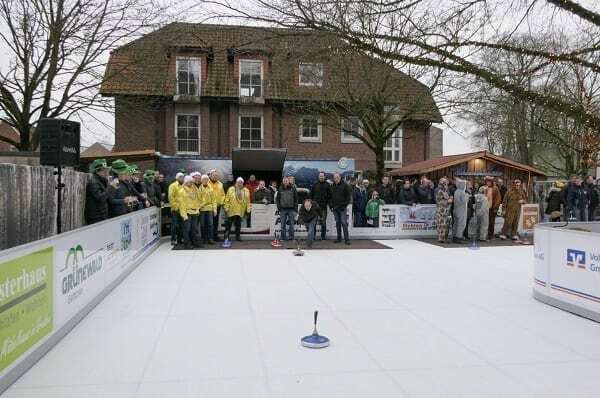 Last year the German Hotel Meyerink came up with a fantastic idea that should captivate the citizens of its home town Vreden: the “Sport Niehuis Cup,” the first Eisstock championship in town – on a waterless Glice® synthetic ice rink, where people participated in teams with funny names and disguises. The event was so popular and successful that Hotel Meyerink scaled up its size from last year’s 32 teams to 64 teams this year! High up in the Swiss Alps, the Bischofalp Berghotel offers guests spectacular mountain vistas– but as of late a new player has been stealing the show: a Glice® synthetic Eisstock curling track with quirky games! Check out the video to see how Swiss tradition meets Swiss innovation! Glice® artificial ice rinks are highly innovative and so is the organizational culture behind the product. 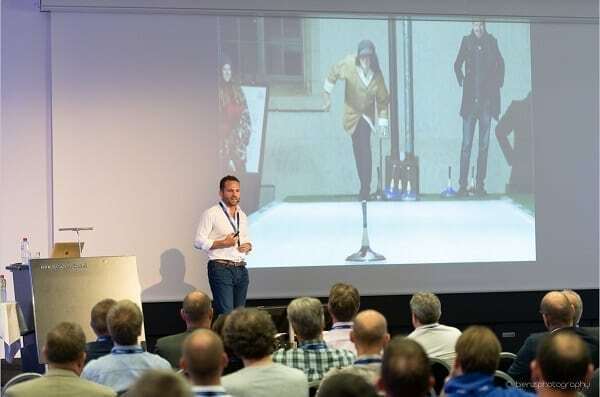 That’s why Swiss IT specialist Adeon invited Glice® CEO Viktor Meier as a keynote speaker. During the event, Viktor elaborated on how Glice® came about and how the startup implemented digital technologies to export its artificial ice rinks into 80 countries within merely 5 years. What if you could enjoy all the perks of winter leisure without the actual freezing cold? 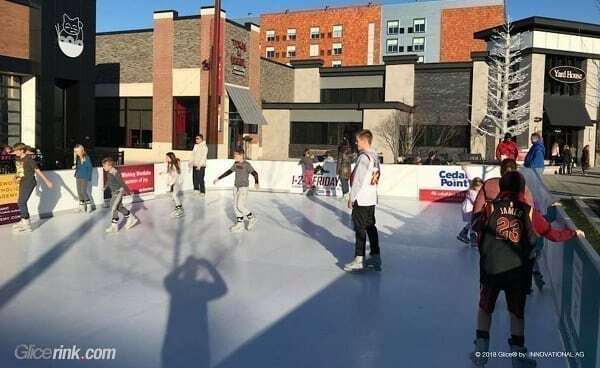 At the Crocker Park Lifestyle Center in Cleveland, Ohio it’s finally that time of the year to say goodbye to the harsh winter, but the ice skating fun continues on an outdoor Glice® synthetic ice rink! Operated without water and energy, the rink is popular year-round and especially fascinating in summer, when you can skate under the warming sun! Glice® artificial ice rinks are big with families and therefore the ideal leisure addition for venues catering to parents with kids. 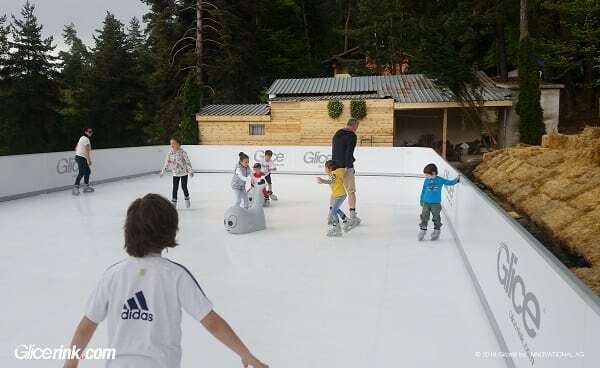 As a family owned hotel and camp, the Food and Dancing Factory in Dedovo, Bulgaria knows what resonates best with its guests and chose a Glice® rink for its gorgeous mountain location amidst forest scenery. Practice makes perfect and never has it been as convenient as with Glice® synthetic ice pads! Now kids can hone hockey and skating skills in the comfort of their own home – in the garden, backyard, basement or garage. Have a look at the video to see how a 6-year-old from Switzerland takes advantage of the new training opportunity to get a head start on his peers.